It was month-end; the numbers did not agree. Our client’s off-shore team was taking too long and couldn’t promise that they would solve the problem before the books had to be closed. At Titan Consulting, we deal with this type of urgent care and support situation all the time. You have a problem you thought your off-shore team could respond to in time; wrong! We developed our Fractional Consulting Services for this reason, to help you when you need it most. You may have heard it called by other names: Micro-Consulting, or Micro Services. We wrote the book on delivering fractional consulting; blocks of short-term work to fix specific problems aka break / fix. We have been providing Micro-Consulting to 20+ clients for the past 10 years. A good example of how to identify problems and fix them fast! Our client was trying to close the books at month-end. The sales tax values were out of sync. Their offshore team looked at the problem and said that it would take a couple of weeks to diagnose the issue. That response doesn’t help when the business needs an answer now. We assigned one of our consultants that had the right experience to take a look. He diagnosed the problem, provided a detailed solution, an estimate, and date to complete the work. He delivered the solution, and they closed the books on time. SAP Micro Services and Micro-Consulting has popped up frequently on Google ads and searches. But it takes more than an app backed by freelancers to fix business and development issues in your SAP system. Guarantee fees and timeframe to fix a problem in most cases. Assign senior consultants that diagnose, solve and deliver solutions when you need it. Understand best practices and technology to devise the right short and long-term solution. Provide spot consulting assignments to handle business or statutory changes. Provide an on-call resource for a specified number of hours per month. Remote, part-time resources for skill sets not needed full-time or evolving skill sets i.e. Security and Governance, Training, CRM or BW Rollouts. Year-end legal and statutory changes for HR, Payroll, Taxes, etc. This approach may not work in all situations, but we find that in many cases, fractional consulting delivers high value in the timeframe when your business needs it. This approach may not work in all situations, but we find that in many cases, fractional consulting delivers high value in the timeframe when your business needs it. Don’t wait for a problem to arise at month-end to find out about our Fractional Consulting Services. 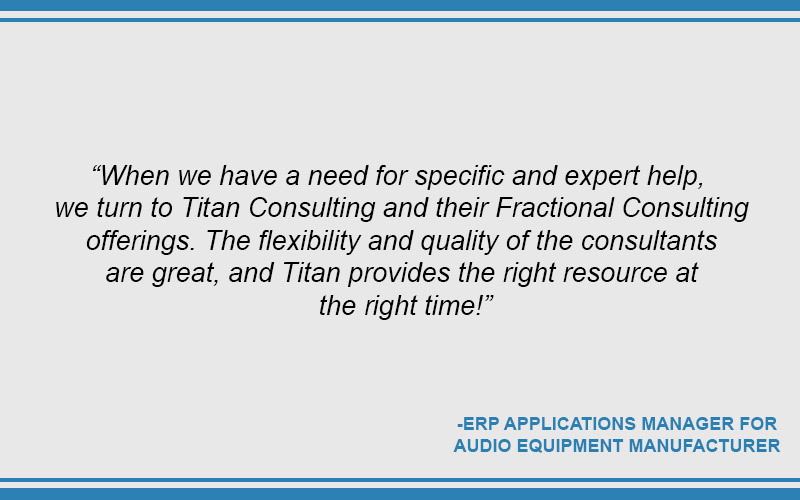 For more information on how Titan’s Fractional Consulting Services can meet your business needs, contact Kent Lamb at 972.377.3525 or email him at kent@titanconsulting. net. Or, contact your Titan Consulting Director.